Now and again, after burning data onto a DVD or CD, we can't access the data because it hasn't been burnt properly onto the disc, or the protocol used to burn it isn't compatible with our system, and it's impossible for us to recover this data. Thanks to CDRoller it's now possible to recover this information. CDRoller is a very practical application that works with all types of optical discs, that will allow us to recover data, split video files, burn recovered data, delete rewritable discs, restore backups stored on discs, analyze CDs, DVDs and BRs, extract audio tracks and test any optical storage device. Read, copy, analyze and manage CDs, DVDs and Blu-rays. 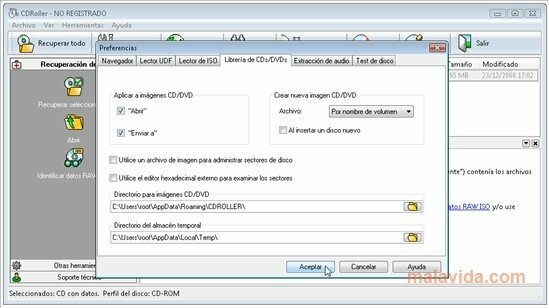 CDRoller is compatible with discs recorded with any program (Nero, Roxio, Alcohol, Packet CD,...) and all sorts of external devices (video camera, audio CD recorder, ...). If you're looking for a way to recover data and solve any problem you might have with an optical disc, CDRoller is the perfect solution. The trial period lasts for 14 days.